In previous posts, I mentioned it already, and now it’s time to share my adventures at Stadt Land Food with you. The whole festival had been a celebration of new ways to produce and consume food, and I started the week-end with a visit at Food Entrepreneurs Club. It’s the brainchild of Stefanie Rothenhöfer who is involved into the Markthalle Neun team as well, and of course I happily followed her invitation to Atelier 2112. 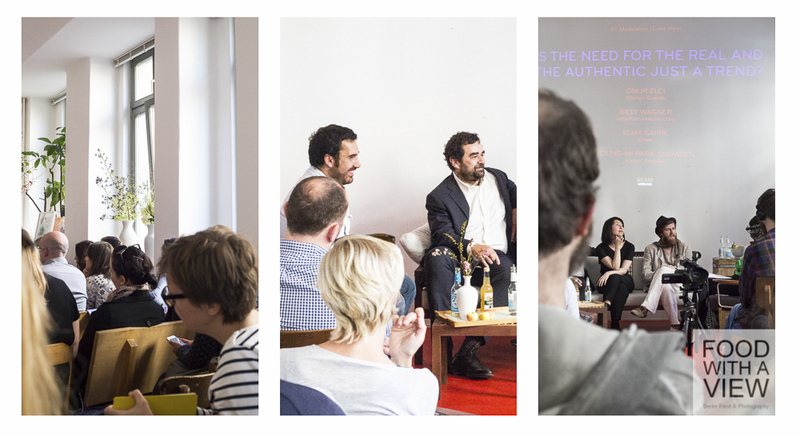 The location could barely gather the crowd – obviously, there are quite a lot of food entrepreneurs in Berlin, those who are already in action and those to be. Wednesday Chef Luisa Weiß opened the program with an outline of what she calls a new food generation – producers, restaurateurs, vendors and consumers that are highly conscious of sustainability, of local production and of the social and animal friendly impacts on food. She also hinted to the community aspect of the new food sector – a highly important aspect to turn an idea into a successful business. 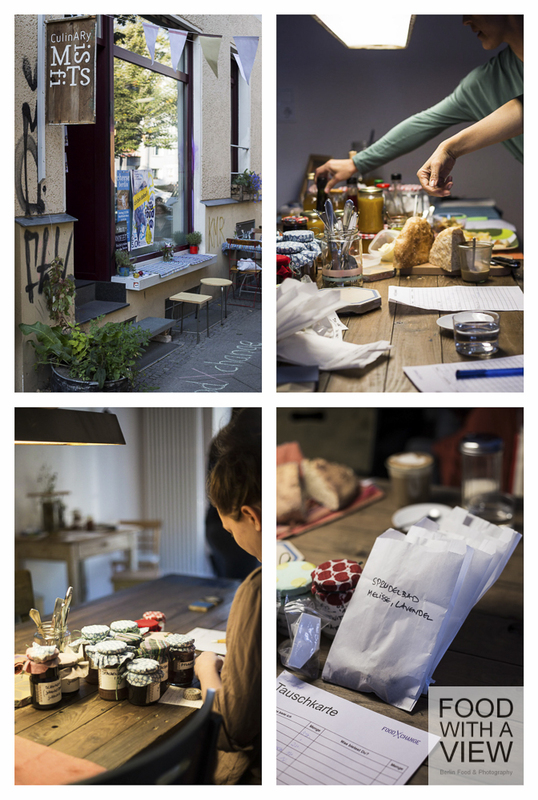 When I listened to her keywords, I had to think of all those places in Berlin that we have introduced on this blog already, from Markthalle Neun and Domäne Dahlem to Agora Food and Prinzessinnengärten, to name but a few, all of them hot spots of a growing network where this new generation meets. 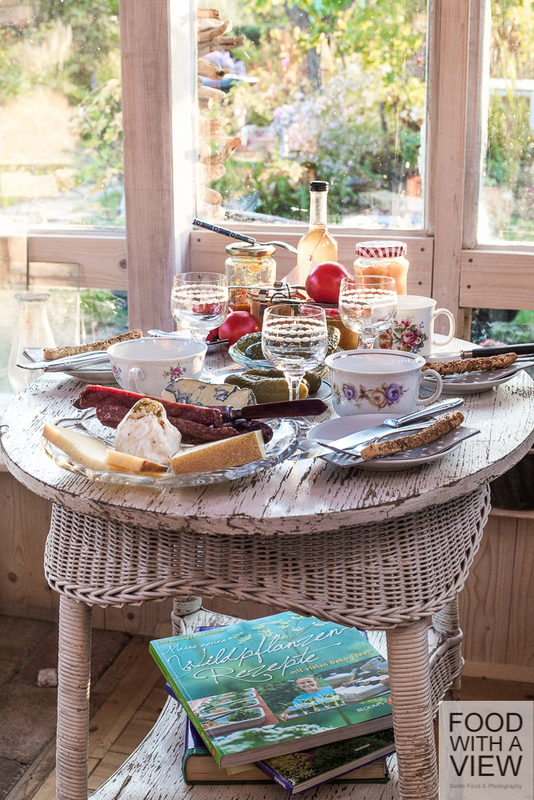 Also from our experiences in London, Dublin, and Amsterdam this year, we can tell that there’s no hip foodie place without one or more labels like organic, seasonal, hand-crafted or fair trade, or without a farmer market, slow baking or re-discovered vegetable varieties at hand. That’s what we love as food bloggers, don’t we – and haven’t we said and wrote time and again that cheese from happy cow’s milk and crops by fairly paid farmers are better both for flavor and for social karma. But why do we think like this – and how long will we do? Is it just a trend? Is it authentic, and what does that mean in the end? The following panel, hosted by Luisa, tried to answer these questions: editor Vijay Sapre of German food magazine Effilee, Onur Elci of the Hamburg-based mobile cooking unit Kitchen Guerilla, iconic sommelier Billy Wagner who is about to open his own restaurant Nobelhart und Schmutzig soon, and restaurateur Young-Mi Park-Snowden of Kreuzberg-based Kimchi Princess. The conversation had been indeed interesting since they didn’t just tally the good food agenda, but really dived into a discussion about trends and individuality as well as about passion and profit – which you will have to make unless you prefer your food activities to remain a costly leisure-time. Everybody on stage could agree on this – and also on individual concepts rather than on the hunt for the lucrative niche. Personal choices and market monitoring – which one is the right way? In the end, it’s the community that decides whether your product is authentic or not, Luisa stated. But what does authenticity mean? Onur Elic assumed that he might be able to serve pizza with his Turkish background better than kimchi, and also to Young-Mi Park-Snowden, authenticity is crucial – her experience is that success is connected to products that you really understand and like. So, what is it that the new food generation really likes? Indian street food with local pork meet from Brandenburg was Wagners answer for example, some really good bread, cheese, and sausages stated Elci. It got quite clear at this point, that everybody on the panel was passionate to make both possible, being successful and keep to personal values. But is authenticity really the best category to describe this? Like Vijay Sapre, I think that the word is too often used and can describe too many things. We will need to take closer looks if it comes to make your choice between a locally produced conventional cheese for example or an organically produced treat from far away. And how about local production and environmental issues anyway – is it just a trend? Sapre assumes that after organic and local, there will be new trends in about five years. Somebody from the audience added, that the food industry reacts on trends soon, and indeed, we find organic or fair trade products in today’s supermarkets as well. So how come that we nevertheless prefer to buy at small, intimate food shops, Luisa asked? Because you trust people and products that you know personally, stated Billy Wagner. He also has confidence in current food scene’s new mixture – people with a professional background in food and those who are autodidacts. Of course they need to be talented, too, he stated, but it’s often them who raise new ideas – both sides could learn from one another. I left the place highly inspired – unfortunately I couldn’t stay longer to listen to more panels about Barcomi’s and the first coffee to go in Berlin, about the compatibility of ethics and profit, or about good communication strategies for good products. I’m looking forward to The Food Entrepreneurs Club’s future events – it seems to be a place to ask important questions and try to find answers, not the least for food bloggers. 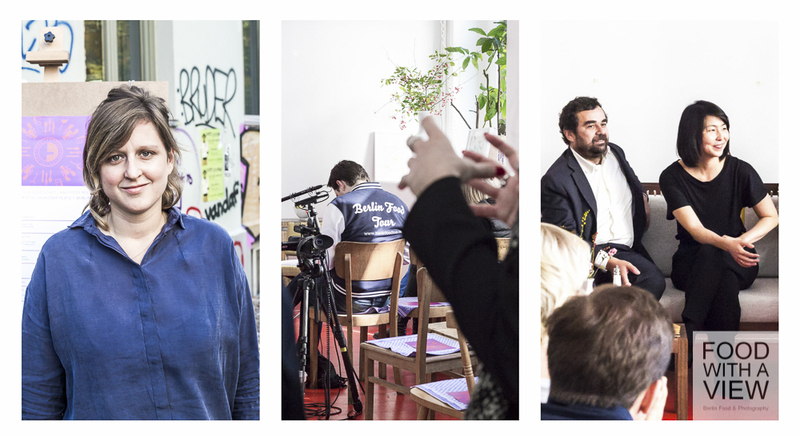 Next day, I attended the private bazaar foodXchange by Cathrin Brandes of Berlin Tidbits and Pamela Dorsch of Slow Food Berlin that took place in the beautiful location of Culinary Misfits. It was all about Thanksgiving (which in Germany was celebrated on this very week-end), and thus I brought with me some buckwheat macarons catastrophiques with pumpkin butter-cream and some emergency chutney with pumpkin and figs. The latter because I ruined three baking trays with macaron shells, and the tiny portion that I could save somehow need a little company. But everything fell into place beautifully, such a bazaar is so much fun! It’s not the last a new form of economy – that’s what a scientist of my former university institute stated who was present as well. Indeed, we enjoyed our new economy, and it worked like this: everybody showed off what she or he has brought along, home-made foodie treats and home-grown crops, and presented little appetizers, and then we started trying them all, completely. In the end. 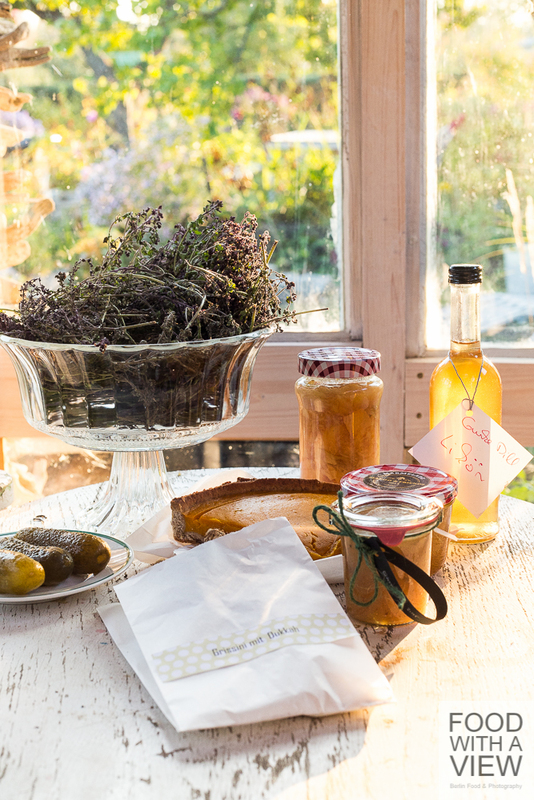 We started swapping – cake for grissini, apple crisps for jam, lemon tarte for quinces. I have no idea how many of our English-language readers are Berlin residents, but if you got curious now and want to join the party as well – I can really recommend to do so – the next opportunity will be on October 29th at 6 pm. It will a special occasion since the project celebrates its first anniversary. That’s worth a meringue cookie, isn’t it – in the end, they tasted quite good, and I got pickled cucumbers by Pamela and cucumber & dill liqueur by Cathrin for it while my chutney had been my currency for mango & coconut jam, quince jam & pulp, pumpkin cake and dukkah-spiced grissini, all of them delicious and prepared by most friendly food swappers. What a great feeling to go home like this – it’s not at least a social event as well, and it’s so wonderful to see what a variety of treats we had assembled. In the end, I met friends who had done some great food shopping at the festival next door, and with our treasures, we made all the way to the lovely garden that I have already introduced to you time and again to have the best Stadt Land Food supper ever with treats from the new and the new old economy. Had been so very lovely – and next day, I needed a rest. Indeed, I had plans to sneak by the festival again in the morning, but a little cold told me to better stay at home with some squash soup and ginger tea on my sofa. 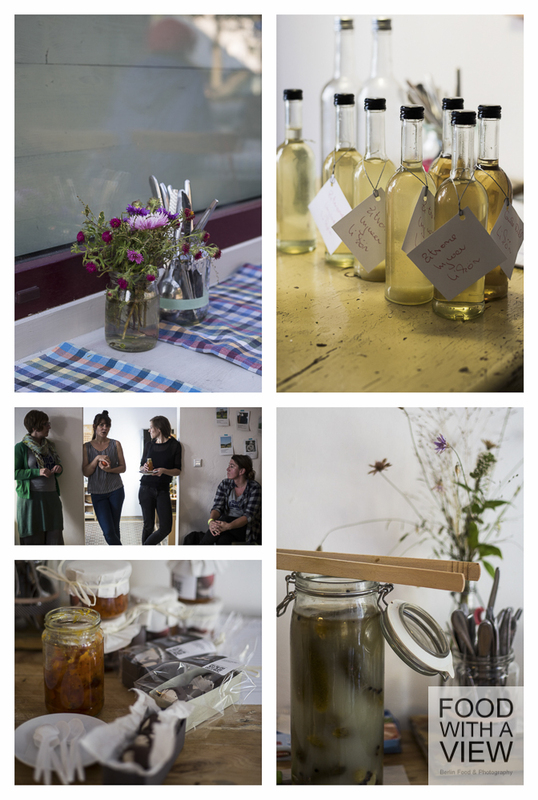 Slow food at its very best – and the next events are at the doors already. 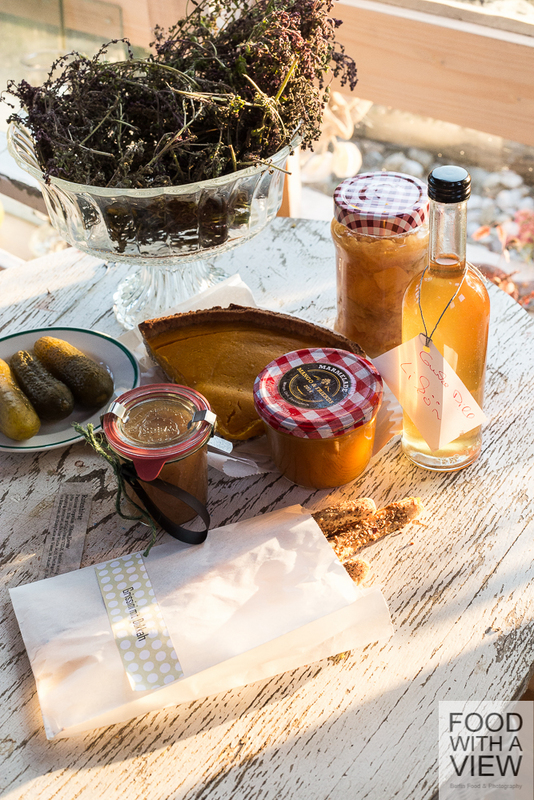 Das Festival Stadt Land Food ist vorbei und will mit all seiner kreativen und kulinarischen Inspiration erst einmal verdaut sein – von zwei seiner Highlights will ich heute berichten. Mein persönlicher Auftakt waren kein Käse-Workshop und kein Craft Beer, sondern die Eröffnungs-Diskussion des Food Entrepreneur Clubs. Der ist ein Brainchild von Stefanie Rothenhöfer, die in der Markthalle Neun den Event-Bereich verantwortet, und ihrer Einladung in das Atelier 2112 am Lausitzer Platz bin ich gern gefolgt. Das konnte den Ansturm am Freitag kaum bewältigen – es gibt in Berlin offenbar sehr viele Food Entrepreneurs und solche, die es werden wollen. Wednesday Chef Luisa Weiß eröffnete mit der Skizzierung einer „new food generation“ – also Produzenten, Gastronomen, Anbieter und Konsumenten mit einem hohen Bewusstsein für lokal und nachhaltig produzierte Lebensmittel sowie für sozial verträgliche und tierfreundliche Produktion. Sie sprach dabei auch über den Community-Aspekt, den es braucht, um aus einer Idee ein Geschäft zu machen – und bei ihren ersten Stichworten ging mir bereits viel durch den Kopf. In Berlin findet man die Orte und Netzwerke, die diese Menschen schaffen, ja vielfach, und von der Markthalle Neun und der Domäne Dahlem über Agora Food bis zu den Prinzessinnengärten haben Arne und ich euch bereits einige auf diesem Blog vorgestellt. Auch unsere diversen Städte-Trips in der ersten Jahres-Hälfte nach London, Dublin und Amsterdam haben uns bestätigt: Ohne Etiketten wie lokal, saisonal, handgemacht oder bio, ohne Hofladen-Anbindung, Slow Baking oder alte Gemüsesorten scheint heute kaum ein begründbar hippes Food-Unternehmen mehr auszukommen. Da jubeln wir Blogger, denn wir haben es ja schon immer gesagt, dass Käse von glücklichen Kühen und Gemüse von fair bezahlten Bauern gut für das Aroma und für’s gesellschaftliche Karma sind. Aber warum denken wir so – und wie lange noch? Bleibt das vielleicht nur ein Trend? Und: Ist das authentisch, und wenn ja, was heißt das überhaupt? Die anschließende von Luisa moderierte Gesprächsrunde ging diesen Fragen nach und war food-prominent besetzt mit Effilee-Herausgeber Vijay Sapre, Onur Elci von der mobilen Hamburger Koch-Unit Kitchen Guerilla, Kult-Sommelier Billy Wagner, der demnächst sein eigenes Restaurant Nobelhart und Schmutzig eröffnen möchte, sowie der Kreuzberger Gastronomin Young-Mi Park-Snowden von Kimchi Princess. Spannend war ihr Austausch auch deshalb, weil auf dem Podium die Agenda vom nachhaltigen Produzieren und Konsumieren nicht einfach schnell durchgewinkt, sondern tatsächlich diskutiert wurde. Trends und Eigensinn genauso wie Leidenschaft und Gewinn – den man am Ende machen will und auch muss, wenn das Unternehmen Food kein teures Hobby bleiben soll. Darauf konnten sich alle einigen, und Konsens war ebenfalls, dass die Lust am eigenen Konzept am Beginn jedes kulinarischen Business-Plans stehen sollte und nicht das Schielen nach der lukrativen Nische. Also nur machen, was einem selbst gefällt, ohne Blick auf die potenziellen Gäste? Oder doch den Markt vor der Haustür beobachten? Hier kam das Stichwort Community ins Spiel: Eine Rolle im Kiez könne nur spielen, wer mit authentischen Produkten überzeugt, so Luisas These. Aber was genau heißt authentisch? Onur Elci warf dazu ein, dass er sich nicht vorstellen könne, plötzlich Kimchi statt Pizza zu verkaufen. Auch für Young-Mi Park-Snowden spielt Authentizität eine Rolle – nur was man wirklich möge und kenne, werde einen Markt finden. Und was genau ist es, was diese new food generation mag? Indisches Street Food mit Schweinefleisch aus Brandenburg zum Beispiel, so Wagners Antwort, ein ganz einfaches Abendbrot mit richtig gutem Brot, Käse, Wurst so Elci. Schnell wurde hier klar, was alle auf dem Podium eint: Der Wunsch, das Geschäft mit Essen und Trinken mit Werten zu verbinden. Ob das mit „Authentizität“ wirklich gut umschrieben ist, sei dahin gestellt – ich bin da mit Vijay Sapre einer Meinung, dass der Begriff ein viel gebrauchtes und auch verbrauchtes Etikett ist, hinter dem sich alles Mögliche verbergen kann. Man muss schon genauer hinsehen – und bei der Frage, ob ich einen konventionell produzierten Käse von hier einem ökologisch hergestellten von weit weg vorziehe, helfen mir keine Vorstellungen vom „Echten“ weiter. Und wie ist es denn nun mit der Umwelt oder der lokalen Produktion – alles nur Trend? Sapre vermutete: Nach bio kam regional, und in rund fünf Jahren werde es eine neue Leitkategorie geben. Auf die stelle sich auch die Lebensmittel-Industrie ein, so eine Zuschauerin – tatsächlich finden wir Bio- oder Fair-Trade-Produkte inzwischen auch im Supermarkt. Warum gehen wir dennoch lieber zu kleinen oder zumindest nicht auf Masse ausgerichteten Anbietern, so Luisas Frage. Weil das etwas mit Vertrauen zu tun habe, dort zu kaufen, wo man die Menschen und ihre Produkte kenne, so Billy Wagner – der persönlich bekannte Winzer zum Beispiel, das sei wie früher bei Mutti, ein Gefühl von zu Hause sein. Zuversicht hat er auch in eine neue Mischung in der Food-Szene: Neben Gastronomen und Händler mit Ausbildungs-Hintergrund treten immer mehr Autodidakten und Quer-Einsteiger. Die müssten natürlich auch etwas drauf haben, würden aber mit ihrer größeren Unbekümmertheit frischen Wind in die Szene bringen – beide Seiten könnten voneinander lernen. Viele Stichworte also, die ich persönlich aus der Veranstaltung mitgenommen habe, und viel Inspiration. Leider musste ich nach dieser Diskussion auch schon wieder gehen – und bei den Food Entrepreneurs ging es laut Programm danach weiter mit einem Rückblick auf 20 Jahre Barcomi’s und den ersten Coffee to go in Berlin, mit einer Talk-Runde zur Frage, wie Profitabilität und ethische Ideale zusammengehen, und mit Überlegungen zu guten Kommunikations-Strategien rund um gute Produkte. Ich bin schon sehr gespannt auf die nächste Veranstaltung: Mein Eindruck ist, dass der Food Entrepreneurs Club wichtige Fragen für Anbieter und Konsumenten in der immer vielfältiger werdenden Food-Branche aufgreift – wichtig nicht zuletzt auch für Food-Blogger. Aber alles wurde gut. Denn so eine foodXchange ist eine tolle Sache – eine neue Form der Ökonomie, wie eine anwesende Wissenschaftlerin auf Feldforschung von just meinem alten Institut an der Humboldt-Universität es formulierte. Ich war freudig überrascht von dieser unverhofften Begegnung – und natürlich von der neuen Ökonomie selbst, der wir dann alle tauschend frönten. Die funktioniert so: Jede und jeder bringt mit, was man geerntet, gekocht, eingemacht oder gebacken hat, und dafür muss man nicht mal einen Food-Blog betreiben, sondern einfach nur Spaß an Selbstgemachtem haben. Das drappiert man mit appetitanregenden Probierhäppchen, und dann wird gekostet, alles und restlos. Anschließend wird gefeilscht und getauscht: Wieviel Zitronen-Tarte kosten die Apfel-Chips, gibst Du mir Safran-Birnen, wenn ich dafür Bettlermarmelade biete, wie viele Quitten ist Dir mein Sanddorn-Sirup wert. Wer das auch mal mitmachen möchte – und das kann ich sehr empfehlen – kann hier die golden rules noch einmal nachlesen und sich gleich für die nächste foodXchange am 29. Oktober um 18 Uhr anmelden. Die ist denn auch etwas ganz Besonderes, denn Cathrins und Pamelas Projekt wird ein Jahr alt. Darauf einen Schaumkeks, verunglückt oder nicht – sie waren am Ende doch ganz lecker und gingen für feine Salzgurken von Pamela und aufregenden Gurken-Dill-Likör auf Wodka-Basis von Cathrin über die Theke. Mein Chutney wiederum war meine Tausch-Währung für cremige Mango-Chili-Kokos-Konfitüre, köstliche Quitten-Marmelade mit Zimt, seidigen Kürbiskuchen und fruchtiges Quitten-Mus von anderen netten foodXchangerinnen. Und ein Tütchen mit leckeren Grissini mit Dukkah-Gewürz bekam ich am Ende auch noch geschenkt. Mit so einem Tauschbörsen-Fang geht man anders nach Hause, als wenn man beim Einkauf eine Liste abarbeitet, denn eine foodXchange ist nicht zuletzt auch ein soziales Ereignis. Ein bisschen Food-Community, wo man bekannte Gesichter wieder trifft und neue kennen lernt, ein bisschen gemeinsamer Stolz, was man da für eine Vielfalt an Selbstgemachtem zusammengetragen hat, und ein bisschen ausgelassener Kindergeburtstag, wo man früher auch tausend spannende Dinge kosten und am Ende ein Tütchen mit nach Hause nehmen durfte. Über mein Tauschgut haben sich am Ende auch zwei Freundinnen gefreut, die zu Beginn vorbeigeschaut hatten und anschließend auf dem benachbarten Festival in einen Food-Shopping-Kaufrausch verfallen sind. Mit unseren Schätzen der neuen und der neuen alten Ökonomie sind wir in den Zauber-Garten geradelt, den aufmerksame Leser dieses Blogs ja bereits kennen. Dort hatten wir das feinste Stadt Land Food Abendbrot, das man sich denken kann, gemeinsam bei Sonnenuntergang im muckelig warmen Gartenhäuschen. Am folgenden Sonntagmorgen wollte ich eigentlich noch einmal kurz losziehen zu Käse-Workshop & Co., aber ein Kratzen im Hals und Gliederschmerzen verhießen nichts Gutes. So blieb es bei Ingwer-Tee und Kürbissuppe mit Deckchen auf dem Sofa, Slow Food im wahrsten Sinne des Wortes. Es hat geholfen: Die erste Herbsterkältung scheint erst einmal abgewendet, und die nächsten Events stehen schon vor der Tür. Der wunderschöne Blog Food with a view hat über die foodXchange berichtet! Dankeschön! Indeed I have been thinking of you, Laura, and how much you have liked it to dive both into the food and the topics at the festival! Maybe there will be something similar in Australia, too, or even better, come over and be a part of it next time :-). Would be so much fun to explore it together. Thanks for the good wishes, best and hugs. Danke für den wunderschönen Bericht – da wäre man gerne dabei gewesen. Vielleicht schaffen wir es ja beim nächsten Mal. Das freut mich, dass Dir der Bericht gefällt, Katha! Wäre toll, wenn Du beim nächsten mal dabei sein könntest, es würde Dir bestimmt sehr gefallen. Ich glaube auch, dass Vertrauen und der persönlich Kontakt eine immer wichtigere Rolle beim Konsumieren spielen wird, liebe Julia. Insgesamt hätten die Themen, die besprochen wurden, so gut zu Dir gepasst, liebe Julia – vielleicht klappt es ja beim nächsten Mal sogar mit einem Besuch in Berlin? Und so eine foodXchange für Augsburg wäre doch eine tolle Sache, die Idee sollte sich wirklich verbreiten. Lieben Gruß zurück! Oh, das wäre wunderbar, Melanie! Ist wirklich toll. Anyway, beautiful pictures as always! So nice to hear from you, Puja, always welcome! I guess this would both have been perfect events for you to attend. Thanks a lot for your thoughtful comment. I totally agree with you that authenticity in the sense of passion and dedication is crucial for food bloggers and food entrepreneurs in general, whether just for fun or for money. Have a wonderful time and best :-).